The Wran, the Wran, the king of all birds. On St Stephen’s Day I was caught in the furze. Give a few pence to bury the Wran. And I’ll wish you all a happy New Year. 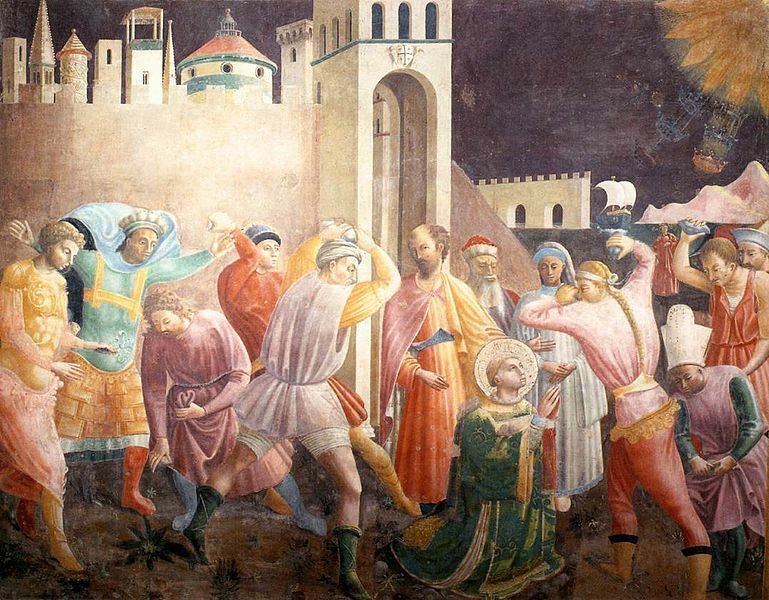 – St Stephen was the very first Christian martyr: in the same year that Christ was crucified he claimed to have a vision of Jesus in heaven standing at the right hand of God. To Stephen’s enemies this was a blasphemy, and he was forced into hiding. 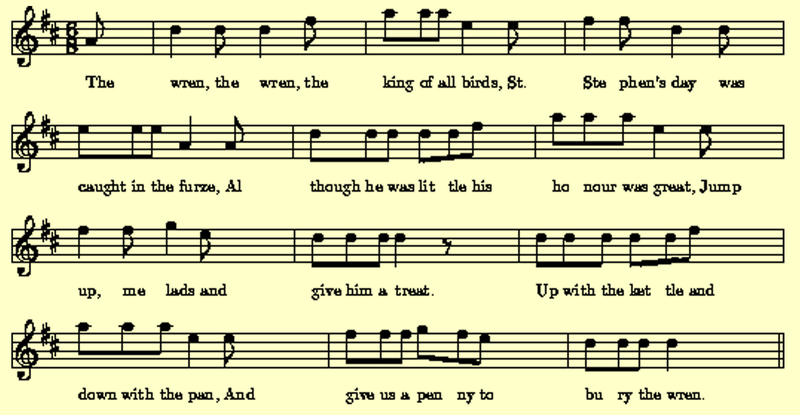 But his hiding place was given away by the song of a little Wren, and St Stephen was publicly stoned to death. In retribution for this the Wren is traditionally hunted in Ireland (and some other Celtic countries) on St Stephen’s Day – December 26th, and groups of Wrenboys carry the bird from door to door – slung from a pole or interred in a small wooden coffin: there was a time when the poor Wren himself would have been stoned to death. 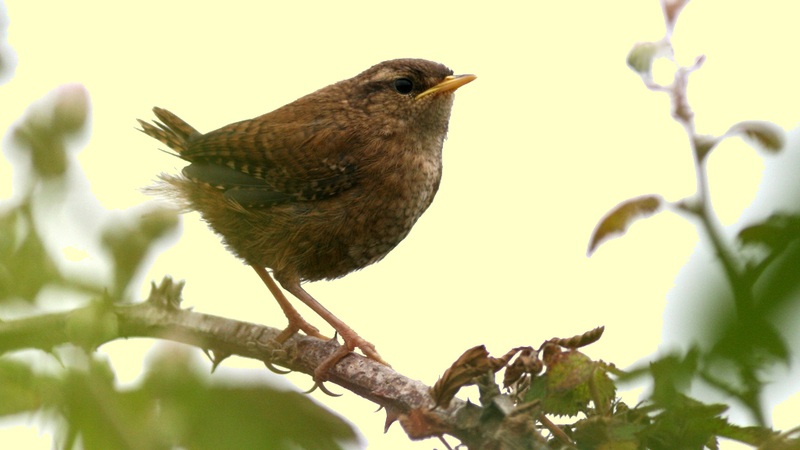 An old story also blames the Wren for alerting a band of Vikings to the approach of the Irish army by pecking on a drum; yet another claims that when Cromwell’s soldiers were asleep and the Irish were about to attack, a flock of Wrens rose into the air and wakened the enemy with the sounds of their wingbeats. So there has always been a strong connection with betrayal. Troglodytidae (cave dweller) is such a small bird: here at Nead an Iolair we occasionally catch sight of him darting out from thick, seemingly impenetrable bushes close to the bird feeder – his movements seem more like a mouse. Small, yet in mythology he’s a giant – King of the Birds in several traditions: Koning Vogel in German, Konije in Dutch, Reytelet in French, Bren in Welsh – all mean King or Little King. When the birds were electing their king they decided that whoever could fly the highest would win the contest; the Eagle easily outflew everyone else but the Wren was hiding in his wings until the Eagle had exhausted himself and then flew on up to claim the title. 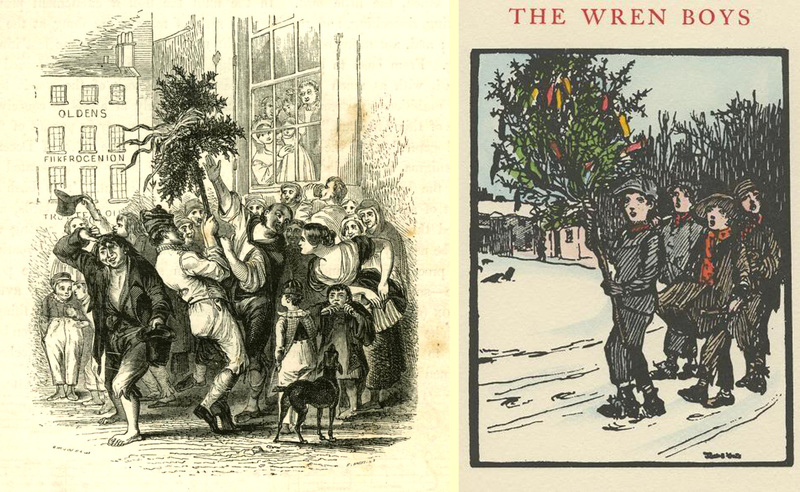 But there’s more: the Wren is forever associated with that turning point of the year when everything goes topsy turvy: the Twelve Days of Christmas. At this time the Lord of Misrule presides and traditional roles are reversed; it’s not surprising, then, that the tiniest of the birds should become the most important. But, like all kings, his reign is finite – and he is sacrificed at the dark year’s end to ensure that the sun will rise again. 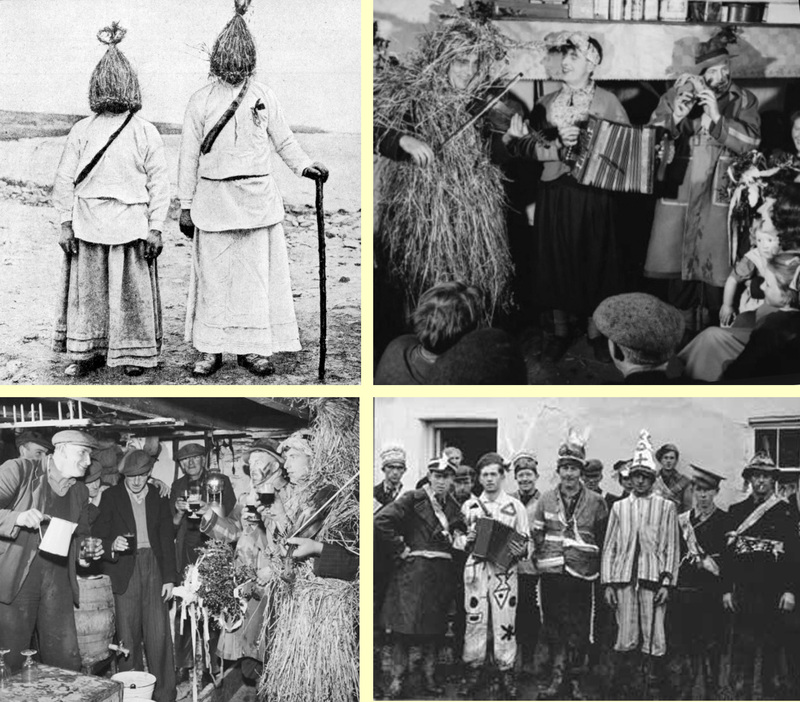 Which brings us to Rhymers… and Wrenboys, Strawboys, Guisers and Mummers… The Feast of Stephen is their day too. 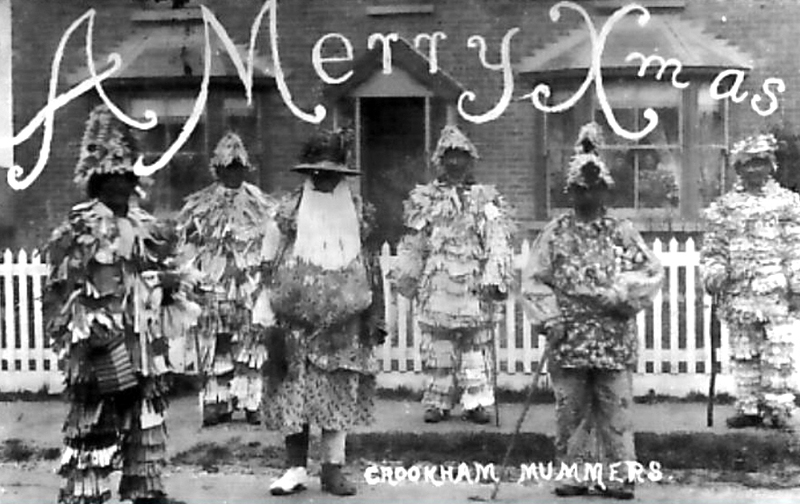 When I was a boy we went out every Boxing Day morning to Crookham in Hampshire to watch King George slaying Bold Slasher, who was miraculously brought back to life by the quack Doctor, after which the young fertility figure Trim Tram Jolly Jack ‘…wife and family on my back…’ killed Old Father Christmas – something which must have seemed odd to a child, who might not have understood the symbolism of the old, dark winter giving way to the new life of spring. Danny tells me that when he was growing up in Limerick he saw the Strawboys or Rhymers performing the same play on the streets – and he remembers the Wren being paraded in procession, too. 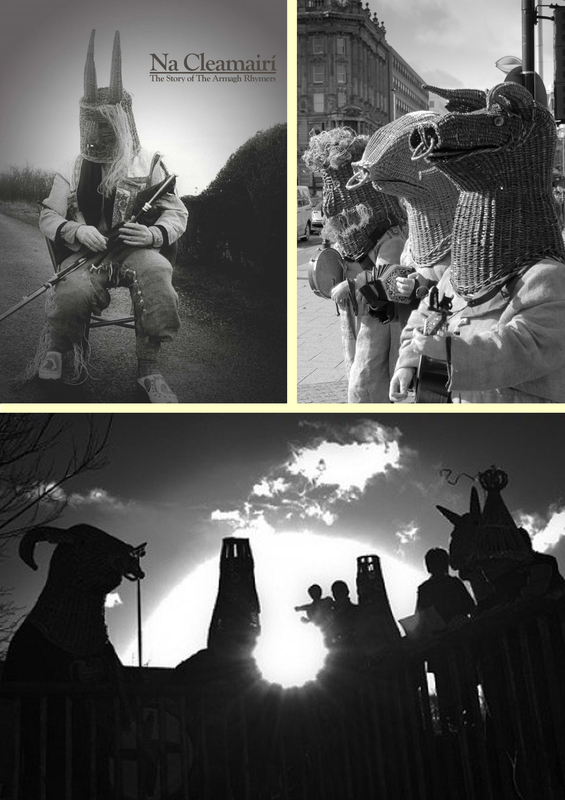 The folk play is alive in Ireland: there are Mummers in Wexford, Cork and Dingle, and the Armagh Rhymers travel across the world to perform their rituals. Here at Nead an Iolair I shall be reciting ‘…In comes I…’ around Christmas time: the words of all the characters are locked firmly in my brain – I have never seen them written down. It’s a true oral tradition – and a surviving one. Who knows – if I don’t repeat those words, the sun might just stop shining… It’s not worth the risk. And – on St Stephen’s day – I shall be on the lookout for a Chime of Wrens, but I love all our birds, so it will only be a token ‘hunt’. This entry was posted in Folklore, Irish History, Nature, Religion, Roaringwater Bay, Wildlife and tagged Boxing Day, Crookham Village Mummers, Guisers, Hunting the Wren, King of the Birds, Mummers, Rhymers, St Stephen, St Stephen's Day, Strawboys, The Armagh Rhymers, Twelve Days of Christmas, Wren Boys, Wren Song, Wrenning, Wrens. Bookmark the permalink. Robert that was amazing blog. I am stunned by your erudition! that made my heart flutter! I played them all at various times – but I most enjoyed Old Father Abraham (a Hampshire version of Father Christmas – dressed in red tatters, with a long white beard and carrying a besom) although that meant I was always the victim, felled by the sword of the young fertility figure Trim Tram, who gave the closing lines of the play: “…Ladies and gentl’men see what I have done – knocked down my poor Old Father Abraham just like the setting sun. So while I sits and takes my ease, good people give us what you please…” Which is, naturally, the cue for passing round the hat! And I always seemed to be Mrs Gamp with her brolly when we did an annual mummers play! Some extraordinary images here. Fascinating about the charming wren – one of the smallest and loudest birds in the garden. In come I, King George, so grand do I appear………….